An interview with Shannon Peterson: coach of The Crystallettes, a synchronized skating team out of Dearborn, Michigan. 33 minutes, 40 seconds. On her most embarrassing skating moment: Brand-new coach, directing an ice show. They introduced me at the end, I came out to do a spin, had not had my skates sharpened in probably a year, and slipped off the edge. I didn’t fall but it wasn’t pretty [laughs]. On why she likes synchronized skating: I love the team aspect. You don’t get that as an individual skater. 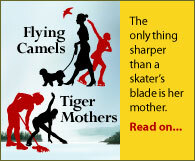 In all my days as an individual skater, I had my friends, but we often ended up competing against each other. With synchro, you’re working with 16 to 20 skaters to produce something. And you go through all of the aches and pains of building a team, and especially with mostly girls – this year it’s all girls for me – they have their little quirks, their little arguments, and that sort of thing. But it’s the working together to create something special. It takes a really special skater, especially now. For my international team, they have to have their senior Moves in the Field and be tested in dance. At least the silver level is what we look for. If they’re not and they can pull off the performance, then they still have to get those dance tests. And now with the moves in isolation, we look for accomplished freeskaters as well. But your great individual skater tends to struggle with skating with 15 other people. You have to match everything. An individual skater, you can go out there, and if you forget your program, it doesn’t matter. You forget a step in synchro and it can be disastrous for the rest of them. 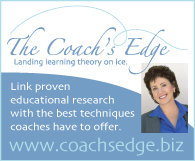 On the size of the program she runs: We have six on-ice coaches, we have two aerobics instructors, one ballet instructor, and two off-ice instructors. And then we have 80 to 100 skaters in any given year. On accidents in synchro skating: I never stop the music in practice unless it’s serious. So our skaters learn to manoeuvre around each other. But they’re skating at such great speed that it can be very very dangerous. And it can also be very dangerous to get back in. If you don’t get back in quickly, if you don’t learn that thinking on your feet to get back into your position fast, and you let one or two manoeuvres go by, then you can really tank on your scores. Many years ago, you know, we had travelling wheels, and the synchro skater has to be very conscious of what’s going on around them. And I remember being at an ice show dress rehearsal, and a girl falling. And when she went to get back in she didn’t take into account that the wheel was travelling, and she clipped blades with another young lady and they both went up into the air, feet in the air. And when the girl came down she got sliced in the arm and severed her artery. It was quick thinking on the part of the stagehand to control the bleeding quite quickly. But you don’t recognize how dangerous it is to put 16 people on the ice, no hockey gear, no pads [laughs], and 16 pairs of very sharp blades. On the enthusiasm of synchro skating fans: We were just at a competition in Kalamazoo, and we’ve got new parents coming up. And I looked at my sister [who coaches with her] and said, “We’ve got to tone that one down”[laughs]. The difference is, when I grew up in skating, you didn’t look at the judges, you didn’t question the judges, you were seen and not heard as a skater, that whole mentality. And I still at times struggle with the mentality of having the conversation with a judge or a technical controller on what does my team need to do. Because I grew up in a time when you didn’t – you couldn’t ask that question. And behavior was so huge when you were at the hotel and such. So that’s how my skaters know they have to behave. Reeling in some of the parents, that can be difficult [laughs]. We always remind them that their behavior is a reflection of the whole program, but that can be very difficult, to try to influence everyone. On making synchro skaters look alike: I have some fake [hair] buns on girls. Because I want them to look the same. Team Surprise, which is the number one team, they have a girl with short hair. And I always notice her. She’s slicked it back, but she doesn’t have a bun, and I’m drawn to her because of it. Having a hair in a bun, all in the same place, all slicked back – back to the days of the Robert Palmer video [laughs] – it just uniforms the look. That is why we used to put the men in tan pants. So when the program got moving, you didn’t focus on my male skaters. And fans either love them or hate them. It wasn’t that I was trying to make them look feminine, the shirts were always a little different, but once the program got moving, I didn’t want you looking at just my male skaters. The ISU a few years ago said they had to be in a coloured pant that matched the costume, but originally that was why we did it. I wanted you looking at the whole performance, not just one or three skaters.